After five consecutive playoff berths – and five consecutive playoff losses – the Cincinnati Bengals have experienced a two-year postseason drought, finishing under .500 in each of the past two seasons. As such, quarterback Andy Dalton & Co. have gone from “close, but no cigar” to a bit of a longshot in term of postseason success. Fortunately for Bengals’ faithful, Cincinnati’s brass took a step in the right direction with their selections in the 2018 NFL Draft, addressing key positions of need and adding to a promising roster. 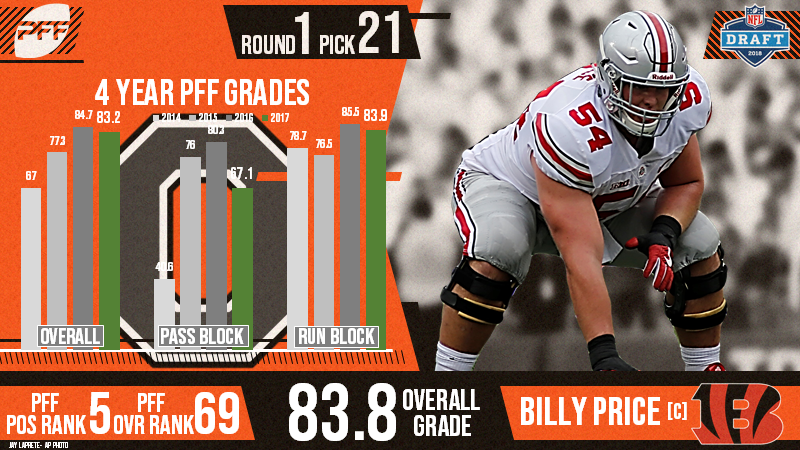 Moving on from veteran Russell Bodine, the Bengals selected former Ohio State center Billy Price with the No. 21 overall pick, an immediate upgrade and potentially long-term starter at the position. The 6-foot-4, 305-pound Price, similarly to Philadelphia Eagles’ Jason Kelce, is a true road grader in the run game, as evidenced by his sixth-ranked run-block success percentage (92.0) in 2017. He also earned 83.9-plus run-block grades in each of his final two seasons with the Buckeyes. Former Wake Forest safety Jessie Bates, Cincinnati’s second-round selection, has starter potential in a two-high system within a quarters-heavy defensive scheme given his ability to stick his man in one-on-one coverage. He’s also quite the force in the run game, but he’ll need to improve as an open-field tackler to reach his maximum potential in that area. He missed 22 of his 107 tackle attempts in his final two years at Wake Forest, 16 of which coming in 2017. Double-dipping in Ohio State’s talent pool, Cincinnati added former Buckeye edge and Queen City native Sam Hubbard with the 77th overall pick (third round). A former safety at Cincinnati’s Moeller High School, Hubbard is a reliable run defender and offers upside as a pass-rusher. His relentless motor allows him to beat blocks late in the play, and he’s one of the most polished edges in the class from a technical standpoint. Cincinnati also had the No. 78 overall pick, allowing them to pick up another star defender in former Texas linebacker Malik Jefferson right after Hubbard. A highly regarded five-star recruit in 2014, Jefferson fell victim to outrageous expectations playing in his home state with the Longhorns. However, he improved every year of his collegiate career in Austin, capping it all off with career-high marks in terms of overall grade (87.2), run-defense grade (88.1) and coverage grade (79.7). Continuing to find value on Day 3, the Bengals added former Western Michigan cornerback Darius Phillips, Toledo quarterback Logan Woodside and Florida State wide receiver Auden Tate as they all fall into their lap in Rounds 5 and 7. Phillips moved from wide receiver to cornerback after his first season at WMU, and he quite effectively nailed the transition from the start. He earned a career-high 84.5 overall grade as a sophomore in 2015 and maintained 80.0-plus grades for his remaining two years. He finished his collegiate career with 12 interceptions and 26 passes defensed. With A.J. McCarron out of the picture, Woodside has a favorable chance of earning either the No. 2 or No. 3 spot in the quarterback room as a rookie. Woodside’s production with the Rockets in 2017 was outstanding, as he ranked No. 1 in the class in adjusted completion percentage against the blitz (81.6) and top-10 in deep pass adjusted completion percentage (57.5), adjusted completion percentage when pressured (67.0) and overall adjusted completion percentage (75.6). At 6-foot-5, 226 pounds, Tate looks the part of an NFL possession receiver, and his production with the Seminoles follows suit. He tied for sixth among FBS wide receivers in contested catch percentage (66.7) and tied for eighth in catch percentage when facing press coverage (64.0). He’s a big man that plays the big man’s game, which Cincinnati surely can take advantage of both in the red zone and on money downs.